Destiny sits snuggled between two makeshift gazebos. The plastic legs of his stool bend as he rocks back and forth. To his left hang bundles of hair and to his right, packed neatly, is an array of the sneakers he sells. Unperturbed by the blistering heat, piercing sounds and pungent smells that engulf Johannesburg’s city centre, he sits fixated on anyone who shows the slightest bit of interest in any of his items. An elderly lady walks past hastily, clutching her purse under her arm. 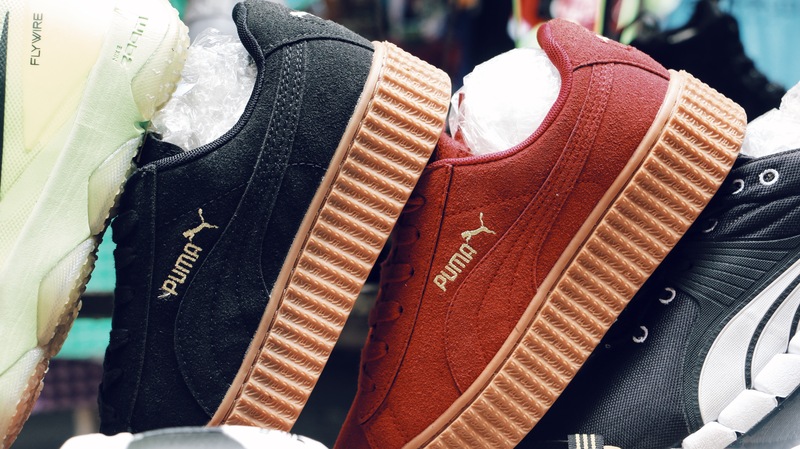 She gazes at Destiny’s stand, motioning towards a size two sneaker, its Puma stamp slightly peeled. Destiny is up in seconds. “How much?” asks the bag clutcher. “My son is a size three,” says the bag clutcher, replacing the sneaker. Hesitantly, the bag clutcher fondles out a couple of notes from her bosom. Destiny is quick to return her change, thanking her simultaneously. 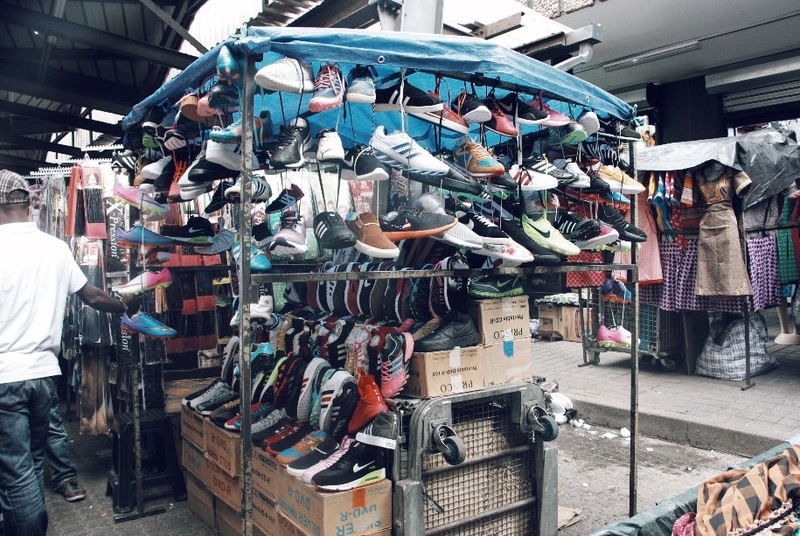 SNEAKER SELLER: Destiny Ogah’s stand at the King George Street the linear market. Destiny Ogah is a 32-year-old foreign national living in Hillbrow. His dark skin and hardened hands indicate a life of long days and heavy labour. His ripped jeans and plain t-shirt barely hide his muscles that bulge through with every movement. Inconspicuously presented, the only thing that stands out are his orange Nike sneakers and bright smile. He came to South Africa in 2012 from Lagos, Nigeria, in the hopes of finding employment. Having graduated from the University of Benin with a Bachelor of Science in Banking and Finance, he found himself without employment in a country with a vast population and very few job opportunities. “If you don’t know someone in Nigeria who can give you a job, there is no hope for you. Graduates like me, without important friends, are left to be hooligans and beggars,” says Destiny. 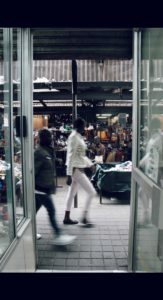 Destiny operates in the linear market situated on King George Street in Johannesburg’s city centre. He is one of the many foreigners who came to South Africa for a better life, but who have resorted to trading counterfeit goods to make a living. “Life is only a little bit better here than in Nigeria. I thought I would be able to come here and find a job as a banker or get a Master’s degree, but I have to sell these shoes to put food on my table,” says Destiny. CBD: The entrance to Jay’s Outfitters. A step behind Destiny’s stand is Jay’s Outfitters, a store that has been selling branded items for 37 years. Inside, the air is still, the only sound that can be heard is the occasional flip of a page by owner Yameen Mayat, who passes time by reading a daily paper. A bell jingles, alerting him of someone entering. A young male customer enters and has a quick browse. He stumbles upon some sneakers that fit his fancy; he turns them over to view the price, replaces them and leaves the store once more. Yameen continues reading his paper. “Business has been slow for about the last five years, ever since this linear market opened,” says Yameen. “And, to be honest, I don’t even blame my customers. Who would be willing to pay the full price for a pair of original shoes if they can get the fake for a fraction of the price on my doorstep?” he adds. 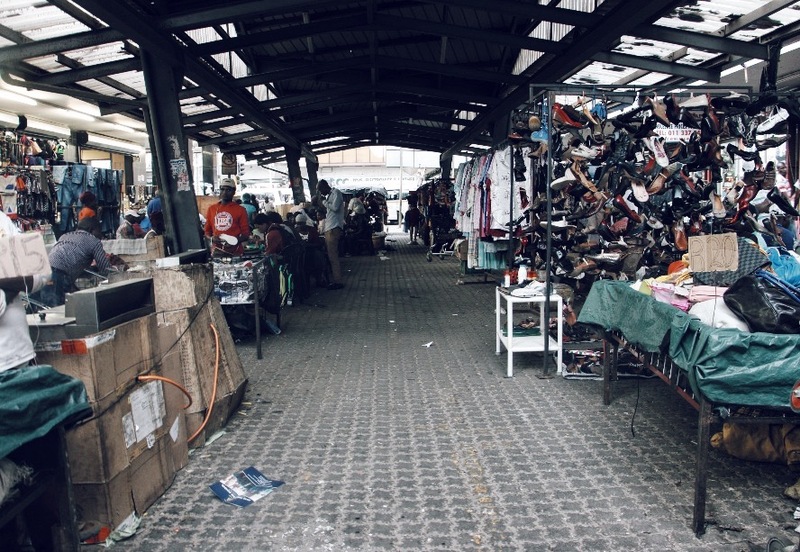 According to a statement released by the City of Johannesburg, linear markets were first established in 2011 as a means of properly managing street trading, as well as ensuring that it did not disrupt pedestrian mobility or passing road traffic. It is an area designated for street trading in a pedestrian environment within the inner city. After a street is chosen to host the market, the city erects a roof to indicate the presence of a linear market. Most serve as a place to purchase goods, such as clothing and electronics or as an informal area to eat for those working nearby. The linear market on King George Street is littered with stands of second-hand clothes, counterfeit goods and digital cameras. The aroma of cooked rice, spicy chicken and chakalaka camouflage the persistent smell of garbage and urine. Yameen and his family opened Jay’s Outfitters in 1984 during the Apartheid era. Due to segregation laws, theirs was one of the very few black-owned shop in the city. At the time business was booming, the city centre was, after all, “the only place to shop”. “Naturally, the area began to change once Apartheid laws were abolished. People of colour were allowed to come into the city and buy anything they wanted. It was an amazing time to be alive,” says Yameen. “But things really changed when the City of Johannesburg built a linear market on the same street my store was on. We are no longer making a profit so we are shutting down at the end of the year,” he says. “I am all for people making a living and I think the linear market helped solve a lot of the problems informal traders were experiencing, but the government has not been monitoring what is being sold in these markets. Most of the goods are fake,” says Yameen. INFORMAL ECONOMY: The linear market on King George Street, is full of second-hand clothes, counterfeit goods and digital cameras. In a press statement released by the Organisation for Economic Co-operation and Development in April 2016, based on international data, it was estimated that imports of counterfeit and pirated goods are worth nearly half a trillion US dollars a year, or around 2.5% of global imports. 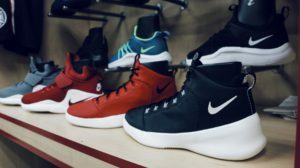 “It is not possible from available data to determine the exact figure fake goods are worth, but there is no denying that it is a huge problem and that it affects the market in many ways,” says Professor Imraan Valodia, a senior lecturer in economics at the University of the Witwatersrand. According to Prof Valodia, the increase in counterfeit goods in a market represents a major threat to business and is also a key barrier to trade. The distribution of cheap and poor quality pirated goods creates an obstruction to the distribution of genuine products. “As the global trade in counterfeit goods is growing, Africa is increasingly being targeted as a market for counterfeit merchandise. Fake goods are not being produced to any significant degree in Africa. These products are mostly imported from Asia, and particularly China,” says Prof Valodia. As such, Africa is fast becoming a “dumping ground” for knock-off goods. A very high percentage of counterfeit shipments from China are destined for Africa, either directly or via ports such as Karachi, Dubai or Hong Kong, in an effort to disguise the country of origin. “The problem of fake goods is increasingly serious and the continent is fast becoming fair game for counterfeiters and it is hurting, not only South Africa, but the entire continent’s population and economy,” says Prof Valodia. UNREAL: The fake sneakers Destiny sells. Wayne Minnaar, spokesperson for the Johannesburg Metropolitan Police Department, says the department deploys “counterfeit operations” continuously but as quickly as the goods are confiscated, the traders manage to replace their stock. “These operations are held by the Gauteng Law Enforcement Agency Forum (GLEAF) which consists of all law enforcement agencies in Gauteng and brand managers who are working together to try and combat this problem,” says Minnaar. According to the spokesperson, GLEAF receives tip-offs from the community, mostly shop owners, that fake goods are being sold. The agency then goes into the market and confiscates all the items, which are then transported to warehouses to be disposed of. One such “Counterfeit Operation” occurred in October 2013 called “Operation Clean Sweep”. The purpose of the operation was to move towards creating a safe and habitable environment within Johannesburg’s city centre. “We managed to impound 528 counterfeit goods, one bad building and arrested 192 illegal immigrants,” says Minnaar. 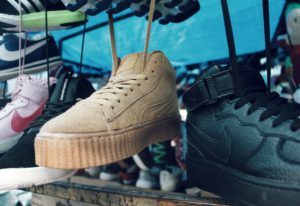 The operation, which saw thousands of legal and illegal traders without an income for weeks, received major criticism from the South African National Traders Retail Association (Santra) and the South African Informal Traders Forum (SAITF). The Socio-Economic Rights Institute of South Africa (Seri), acted on behalf of SAITF, and filed an application for an interdict in the high court against the city for “illegally and violently” removing traders. According to a press statement released by Seri, the traders were evicted even though each had a right to trade in the area, granted through permits issued by the City of Johannesburg itself. Without warning or explanation, they were removed from the streets in a mass eviction operation. Many were assaulted and had their goods trashed. All lost large quantities of valuable stock. Seri stated in a press statement that the municipality of Johannesburg did not seek to justify its “brutal and humiliating” eviction of the informal traders, nor had it been prepared to repair the damage it caused. “Immediately after Operation Clean Sweep was abolished, things improved drastically but as time has gone on, it has deteriorated again. Traders are at risk of having their goods confiscated without warning and are regularly taken advantage of by officials,” says Nomzamo Zondo, Seri’s director of litigation, who acted for the traders. Yameen remembers Operation Clean Sweep vividly. “The city centre was in shambles! It was very sad to watch the police come in and remove so many people from the city. The linear market wasn’t cleared, but a lot of goods were confiscated,” he says. “I didn’t agree with the way it was done but I do think the police must do something about all the fake goods. I have to pay a licence fee to sell original items, plus rent, levy, tax and so on. The guys outside aren’t paying anything,” says Yameen. THE REAL DEAL: Jay’s Outfitters has been selling original, branded items since 1984. According to Yameen, the problem will be rectified once “the playing field” is equalised; when every trader is subjected to the law, liable to the same taxes, the same conditions of trade and to abide by all the bylaws regarding street vending. “All I want is to be able to trade in a safe and fair environment, where every storekeeper is a legal entity, where rentals are fair and not subjected to a false demand allowing unscrupulous traders to manipulate rentals,” he says. Yameen, noticeably frustrated, lowers his voice that was now filling the store, when he hears the bell ring indicating a customer coming in. Outside, Destiny has offered his chair to a young man who has shown interest in a pair of navy blue Adidas sneakers. Destiny makes a profit of around R1 000 per month. His earnings go towards the rent he pays for his room in a Hillbrow flat, food and the rent of R800 per month that he pays a South African citizen who owns his stand. The owner of the stand then pays the City of Johannesburg a mere R100 for rent. “I know I am being ripped off, but I cannot own my stand because I do not have an ID, so I have to go through a South African, who makes me pay eight times the price,” says Destiny. Like many foreign nationals living in South Africa, Destiny does not enjoy citizenship and the benefits that come with it. He says the lack of a South African identification document means he cannot own property or open a bank account. Thus, desperate for an income, he has resorted to selling counterfeit sneakers. “It’s basic economics, there is a demand and I am creating a supply,” he says, pocketing money from the sale while returning to his original seated position. “Besides, this stall is all I have,” he says, steadying himself on one of the poles as he rocks back and forth on his plastic stool.